From Twitter I learned about dhQuest – a game of digital humanities. 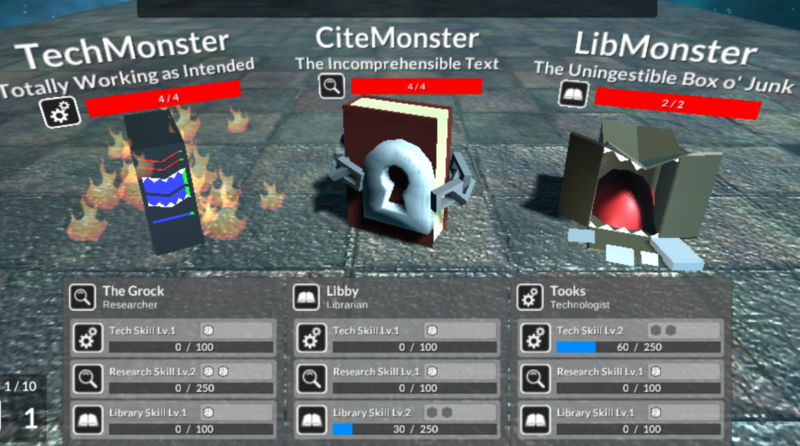 In the game I played (with just one player) I had three characters (a researcher, a librarian, and a technologist) that I deployed to complete quests as I built a digital humanities centre. Very nicely done. I could see in my daily work how difficult it was to inform people about their privacy issues. Nobody seemed to care. My hypothesis was that the whole subject was too complex. There were no examples, no images that could help the audience to understand the process behind the mass surveillance. The answer is to mock up a design fiction of an NSA surveillance dashboard based on what we know and then a video describing a fictional use of it to track an architecture student from Berlin. It seems to me the video and mock designs nicely bring together a number of things we can infer about the tools they have. 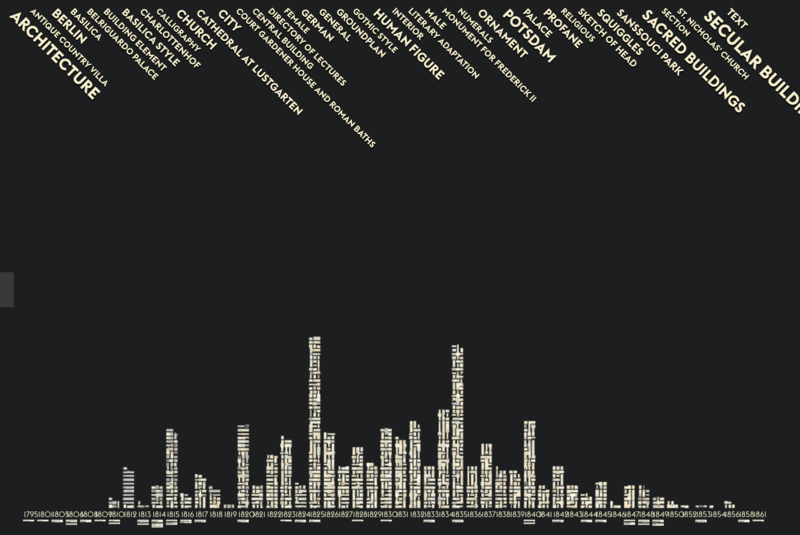 This visualization was developed by the research project VIKUS – Visualising Cultural Collections at the University of Applied Sciences Potsdam. Thanks to Johanna for introducing it to us. Which Words Are Used To Describe White And Black NFL Prospects? I’ve been meaning to blog this 2014 use of Voyant Tools for some time. Which Words Are Used To Describe White And Black NFL Prospects?. Deadspin did a neat project where they gathered pre-drafting scout reports on black and white football players and then analyzed them with Voyant showing how some words are used more for white or black players. 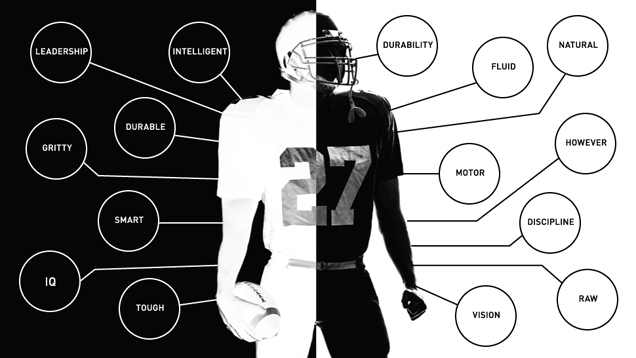 Continue reading Which Words Are Used To Describe White And Black NFL Prospects? From the panopticonopolis tumblr I’ve discovered Metropolis II by Chris Burden. What an interesting take on the city. Panopticonopolis (try saying it) by Misha Lepetic has mostly entries on cities, some of which appear in 3 Quarks Daily. Another article on The Forgotten Archipelago asks what happened to the Soviet ZATP cities – the special purpose, closed and hidden cities set up for secret research. What happened when the Soviet Union collapsed and the federal government could no longer fund these single-purpose cities? I was led to the panopticonopolis from an article on Blob Justice, Part 1 which looks at the herd shaming that is taking place on the Internet starting with Cecil the lion. I can’t help wondering if this sort of Internet stampede is related to gamergate and Anonymous. One could use it to leave information about a place. It could be used by artists to leave AR works as imagined by William Gibson in Spook Country. One could create alternate reality games with it. Alas, it is not available in the Canadian App Store. Raw 1.0 – Basic Tutorial from DensityDesign on Vimeo. 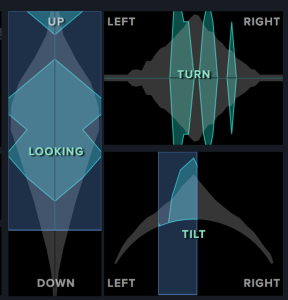 Stan drew my attention to Raw an online visualization tool that is simply elegant. You paste in some data, choose the type of chart, drag and drop dimensions to be graphed and bingo. It reminds me of Many Eyes but simpler to use. Stan pointed me to a net site called Selfiexploratory where you can explore selfies with a very neat faceted browsing control panel. The panel lets you restrict the selfies to those where the person looks up or down; or the head is tilted. You can thus explore the database of selfies by pose and other categories. 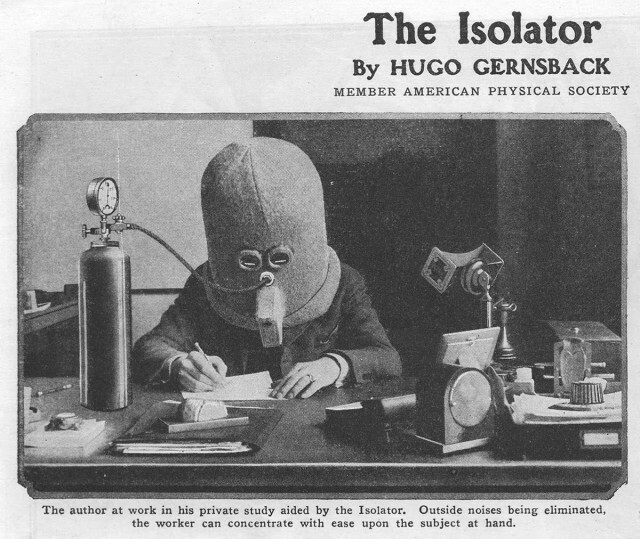 One wonders if it works? Could it be even more useful now? Bill Buxton has made available his collection his Buxton Collection of Interactive Devices. This collection of input and touch devices like chord keyboards, watches, pen computers, and joysticks. I saw some of his collection when at GRAND in 2011 as he mounted a display for CHI 2011 which took place right before. 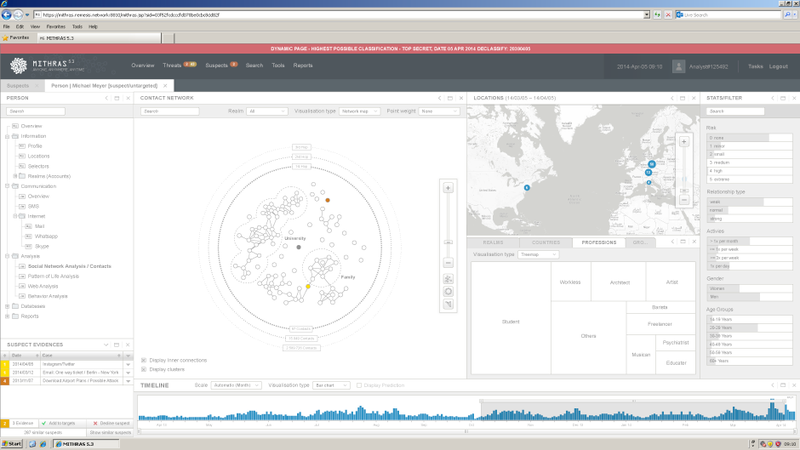 What is doubly interesting is the Microsoft Silverlight PivotViewer which is for exploring large sets of visual objects. You can explore the Buxton Collection with Pivot if you install Silverlight. Apparently Pivot is discontinued, but you can still try it on the Buxton Collection. 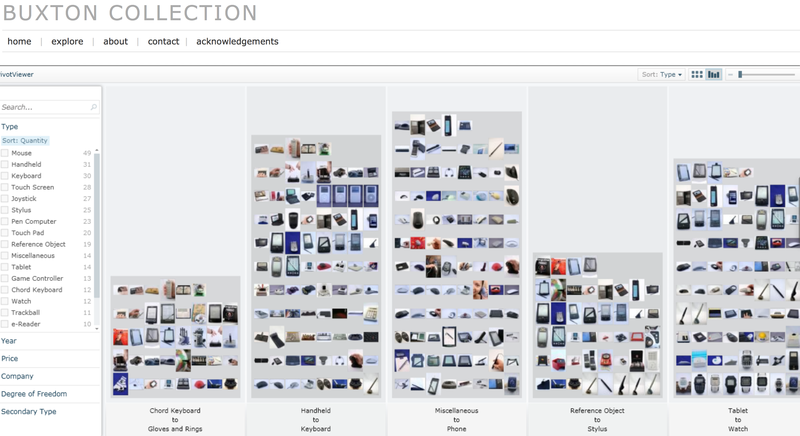 The interface of the PivotViewer reminds me of Stan Ruecker’s work on rich prospect browsing. He developed an interface that always keeps the full set of objects in view while drawing some forward and minimizes others.